The Michigan primary is fast approaching. Democrats and Republicans will head to the polls on August 7 to decide who they want to represent their party in the November governor’s race. Three Democratic candidates hope they’ll be chosen, and money – and the television ads it buys – has played an interesting role in the Democratic race so far. New campaign finance reports suggest this year’s governor’s race may end up being the most expensive in Michigan history. The August primary will select the Democratic, Republican and Libertarian party nominees for governor. Democrats running for Michigan governor held their second and final televised debate Wednesday just weeks before the August 7 primary. Abdul El-Sayed and Gretchen Whitmer focused on the influence of corporate money in politics and had sharp exchanges. Democratic gubernatorial candidate Abdul El-Sayed has proposed a sweeping overhaul of Michigan’s public education systems that would increase school funding, provide universal early childhood education, and make college near tuition and debt-free for most students. 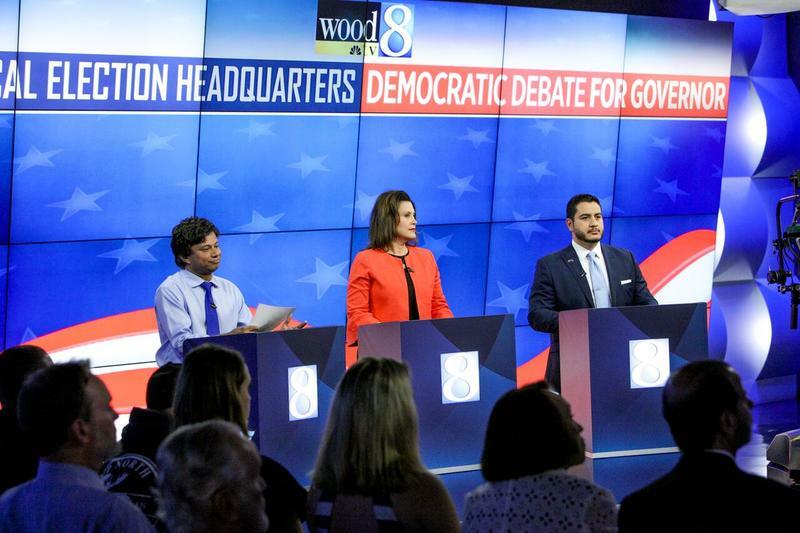 The three top Democratic candidates for Michigan governor debated last night on WOOD-TV in Grand Rapids. 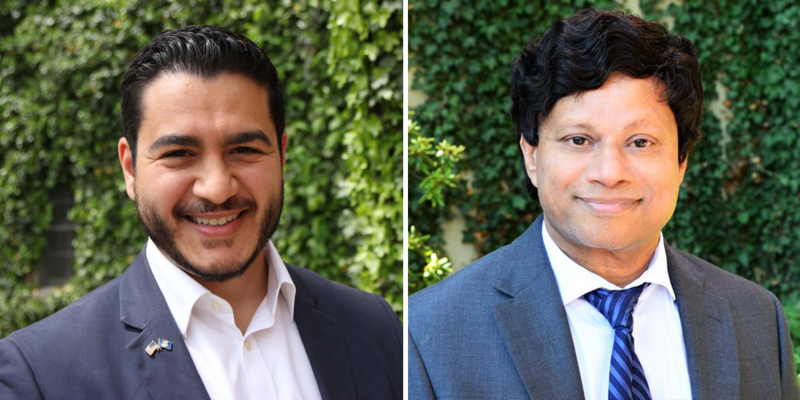 Shri Thanedar, Gretchen Whitmer, and Dr. Abdul El-Sayed had one hour to make their case to voters. One candidate presented himself as an immigrant success story, another as the son of immigrants, and the third as the only one with experience in governing. Adrian Hemond is a Democratic political strategist with Grassroots Midwest. He sat down with Stateside to discuss what stood out at last night's debate. 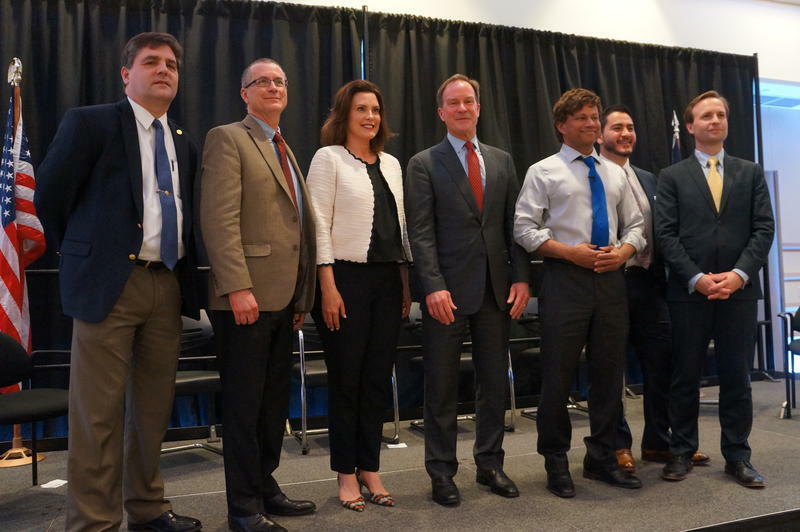 Immigration and infrastructure were a couple of the big themes as Michigan’s Democratic gubernatorial candidates debated one another in Grand Rapids last night. Gretchen Whitmer, Shri Thanedar and Abdul El Sayed share the stage. Thanedar, the only candidate born outside the U.S, says there is a lot of discrimination against immigrants in Michigan. “I see that discrimination because I’m an immigrant and I see the discrimination because of the color of my skin. And thousands of Michiganders experience that,” Thanedar said. "I believe every Michigan kid has a birthright to a great public education," says Democratic candidate for governor Gretchen Whitmer, unveiling her campaign's plan for education on Friday. 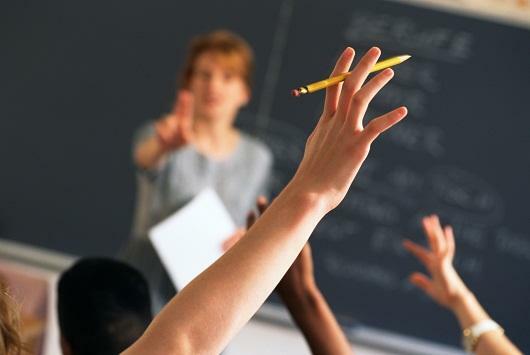 Whitmer says Michigan used to have one of the best public education systems in the country; now it's in the bottom ten. She says K - 12 schools have to get more money, so first and foremost, the state needs to stop "stealing" money from the School Aid Fund. Updated on 6/7/18 at 11:10 am. On the day Michigan's state legislatue moved to repeal the state's prevailing wage law, one Democrat running for governor was focused on health care. The race to replace Governor Rick Snyder is on. Here on Mackinac Island this week, we learned from a gubernatorial debate: That Democrat Gretchen Whitmer is a mom. She’ll “Fix the Damn Roads.” And she has a “backbone of titanium.” Just ask her. 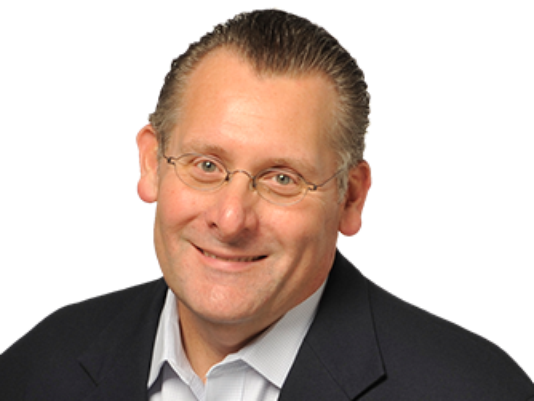 Republican Pat Colbeck has Michigan’s roads disaster all figured out. He’d order “a complete review” of the state’s road-building process and upgrade them to higher standards – all without raising taxes. Right. Democrat Abdul El-Sayed would dismantle the “Betsy DeVos agenda” for Michigan’s public schools and “end this profit motive in our schools.” And every student coming from a household making $150,000 or less should graduate from college debt-free. How and who’s paying the tab he didn’t say. The Michigan Board of State Canvassers has unanimously upheld Shri Thanedar's nominating petition signatures in his bid to be the Democratic nominee for governor, The Associated Press has reported. The board on Friday rejected a challenge from a primary rival, Abdul El-Sayed. The grievance claims most of Thanedar's petitions contain offenses ranging from voter information clashing with the qualified voter file to potentially falsified signatures of petition circulators. Week in Review: GOP candidates hold first debate, and study gives term limits a "thumbs down"
The four Republicans running for governor held their first debate this week. It was the first time Attorney General Bill Schuette, Lt. Gov. Brian Calley, Sen. Patrick Colbeck and Dr. Jim Hines have appeared together on one stage. There were arguments over the handling of the Flint water crisis and who's the biggest Trump supporter. 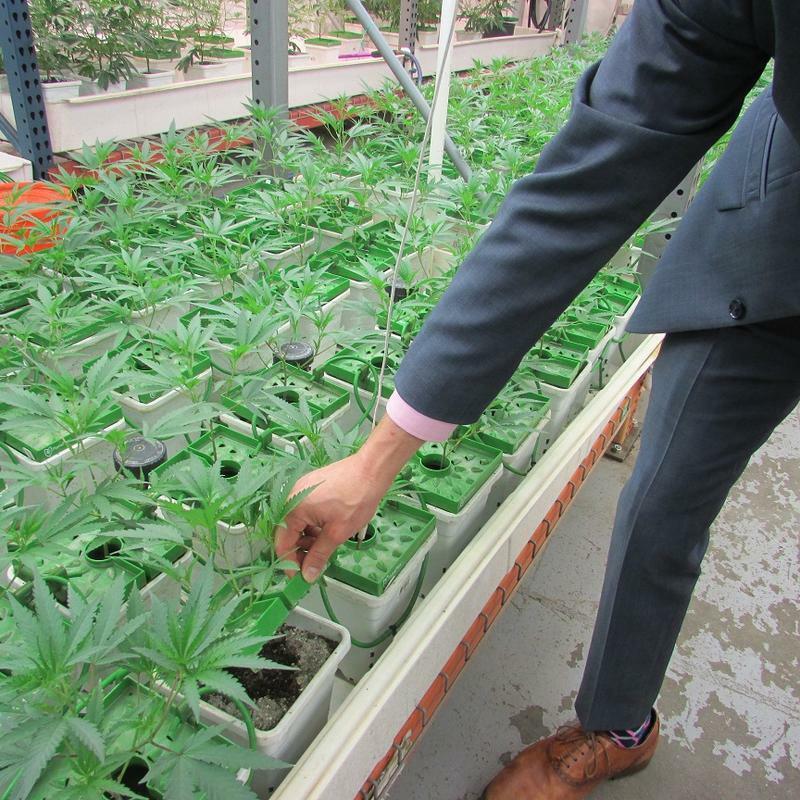 One thing they all agreed on is that Michigan should not legalize recreational marijuana, but they said they'd respect the wishes of the voters. This Week in Review, Weekend Edition host Rebecca Kruth and senior news analyst Jack Lessenberry talk about what else stood out in the debate. Political roundup: Do voters get anything out of early debates? Stateside’s conversation with Ken Sikkema, senior policy fellow with Public Sector Consultants and former Republican majority leader in the state Senate, and Vicki Barnett, former mayor of Farmington Hills and former Democratic legislator. This week on the political roundup, Ken Sikkema, senior policy fellow with Public Sector Consultants and former Republican majority leader in the state Senate, and Vicki Barnett, former mayor of Farmington Hills and former Democratic legislator, joined Stateside to discuss their takeaways from the first Republican gubernatorial debate and a forum that brought Republican and Democratic candidates together in East Lansing. The four Republicans and three Democrats running for governor appeared on a stage together for the first time today. 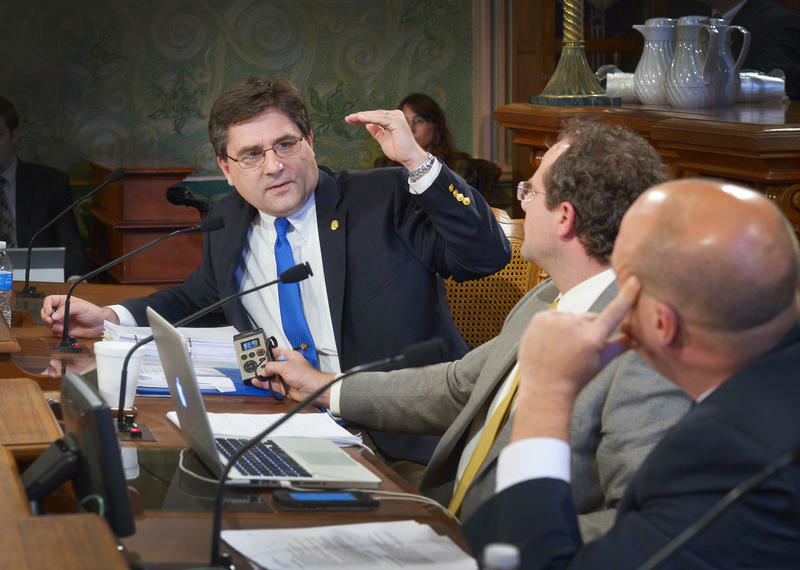 The biggest flashpoint came when Republican state Senator Patrick Colbeck said one of the Democrats has connections to Muslim terrorist groups. Abdul El-Sayed fired back that other Republicans should join him in condemning the allegation. State officials say a top Democratic candidate for governor is eligible to run. 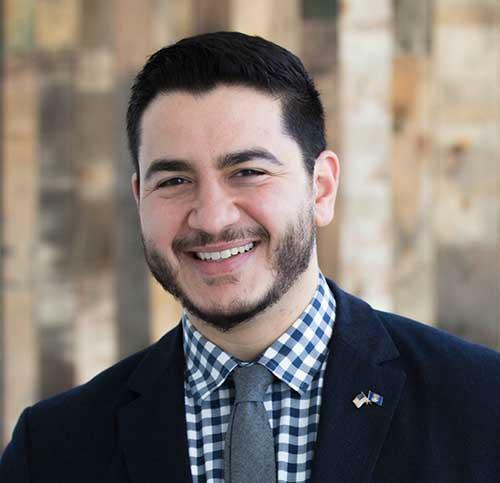 Abdul El-Sayed was registered to vote in New York state from 2012 until 2015. Michigan’s Constitution requires candidates for governor to be a registered voter in Michigan for at least four years prior to taking office. But despite that, the state Bureau of Elections says El-Sayed, the former Detroit health department director, is still eligible to run for governor. Political roundup: How far can Schuette go with President Trump’s endorsement? This week on the political roundup, Ken Sikkema, senior policy fellow with Public Sector Consultants and former Republican majority leader in the state senate, and Vicki Barnett, former mayor of Farmington Hills and former Democratic legislator, joined Stateside to discuss recent developments in the primary races for governor. Patrick Colbeck is a Republican running for governor. He was videotaped saying a Democratic candidate, Abdul El-Sayed, is part of a Muslim plot to take over the country through “civilization jihad." He also claimed El-Sayed’s parents have ties to the Muslim Brotherhood in Egypt. Colbeck’s claims, which have been posted to a white supremacist Youtube channel, are not supported by facts. But yesterday, he doubled down on the allegations during a speech on the Senate floor. There is a legal question about whether Democrat Abdul El-Sayed is eligible to run for governor. But one thing that is not a question is the fact that the question is not settled, no matter how much the El-Sayed campaign might want to believe that’s the case. The state says now is not the time to rule on whether a candidate for governor is eligible to run. That could mean the question will wait until after Democratic voters make their choice in the primary. 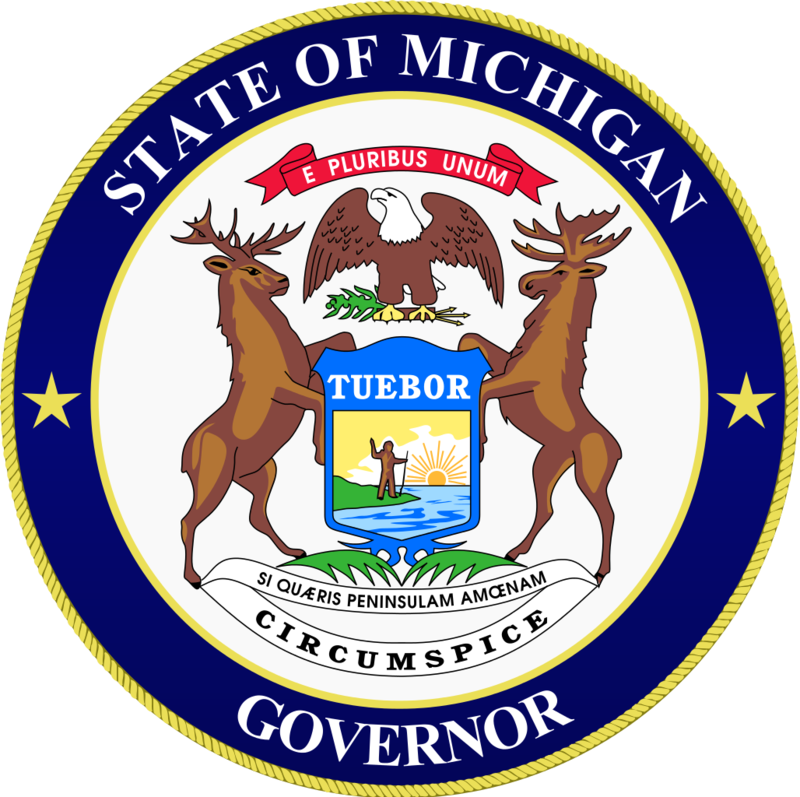 The state constitution says a candidate for governor must have been a registered voter in Michigan for at least four years before the election. Democratic hopeful Abdul El-Sayed voted in New York in 2012, and the question is whether that invalidated his Michigan voter registration until he re-registered here in 2016. El-Sayed to Duggan: Halt Detroit demolitions, "willingly putting children in harm's way"
Abdul El-Sayed shows no sign of backing away from a feud with Detroit Mayor Mike Duggan over the city’s building demolitions program. This week, Stateside is interviewing the Democratic candidates for governor ahead of their party’s 2018 State Endorsement Convention. The gubernatorial candidates will face off in the August primaries. Abdul El-Sayed is the former director of the Detroit Health Department. His campaign has been a little bumpy - late last month, he asked a court to rule if he's eligible to run after some elections law experts claimed he might not be. Gov. 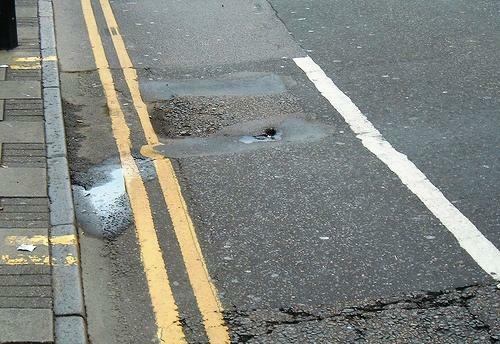 Rick Snyder says it's time to raise the federal gas tax to fix Michigan's disintegrating roads. Snyder says the state has done its part by increasing fees and fuel taxes, and local governments have come up with their own ways to increase revenue. Now, he says its the federal government's turn to step up. This Week in Review, Weekend Edition host Rebecca Kruth and senior news analyst Jack Lessenberry talk about whether that's a realistic expectation. 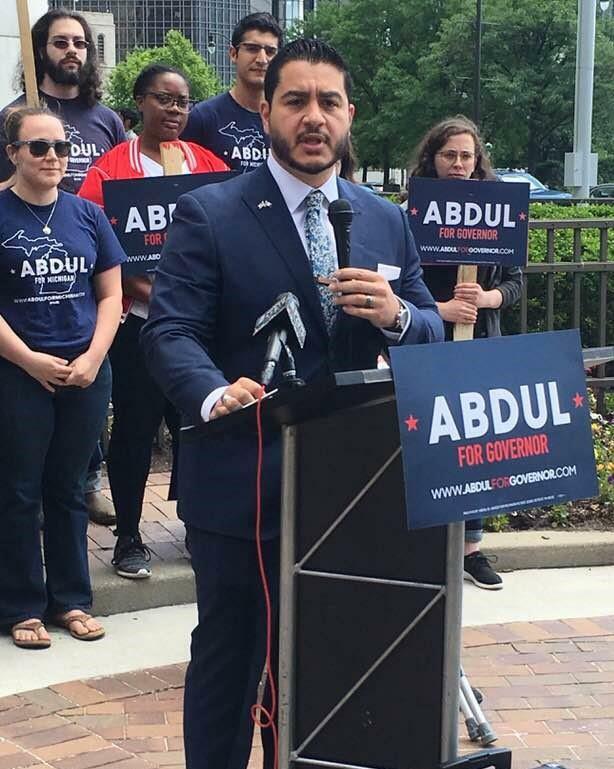 Democratic candidate for governor Abdul El-Sayed has asked a court to rule if he's eligible to run, after some elections law experts said he probably isn't. El-Sayed, a Michigan native, lived in New York from 2011 to 2016. 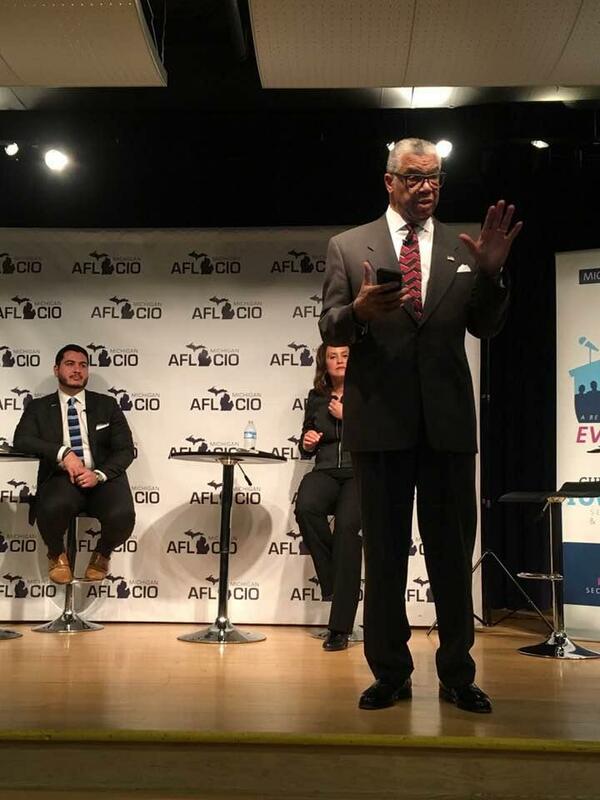 The four Democrats vying become Michigan’s next governor talked public education and public sector jobs at a union-sponsored town hall in Detroit Tuesday night. Gretchen Whitmer, Abdul El-Sayed, Shri Thanedar, and Bill Cobbs largely agreed on the issues. 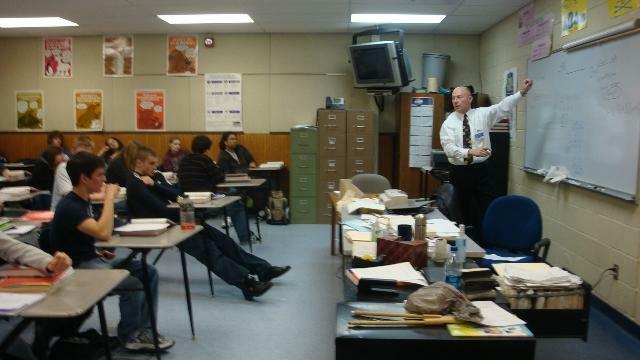 All agreed that teachers are underpaid, under-valued, and that arming them is not the answer to school shootings. Michigan State University's interim president and former Gov. John Engler has appointed an interim athletic director and said that no candidates from MSU would be considered for the permanent job. 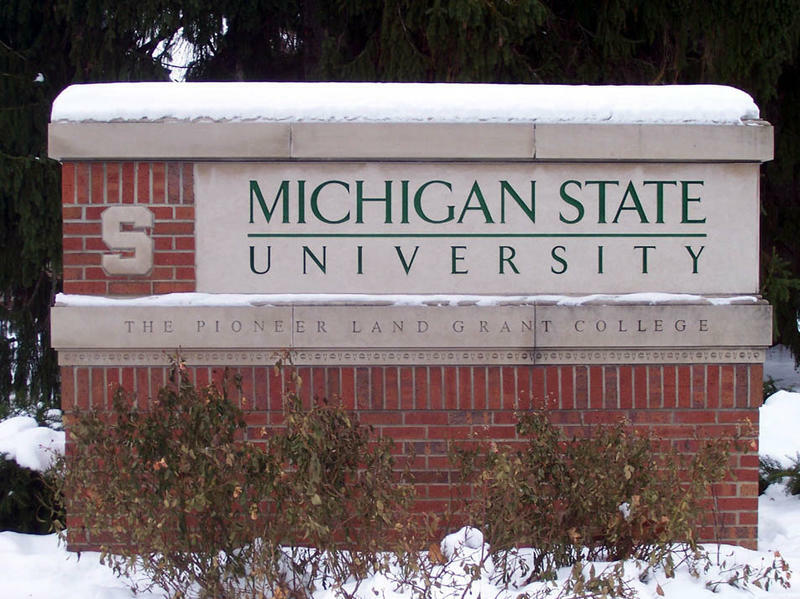 He has also ordered MSU staff to preserve anything that could be evidence for various sexual assault investigations. Abdul El-Sayed’s did not have a good week. And it’s not looking like it’s going to get better any time soon. El-Sayed has captured the imagination of progressives who think he can bring a liberal agenda to Lansing and become the nation’s first Muslim-American governor. This past weekend, at a Democratic forum for Michigan’s gubernatorial candidates in Washtenaw County, there was a throng of excited folks all waiting to talk to him.